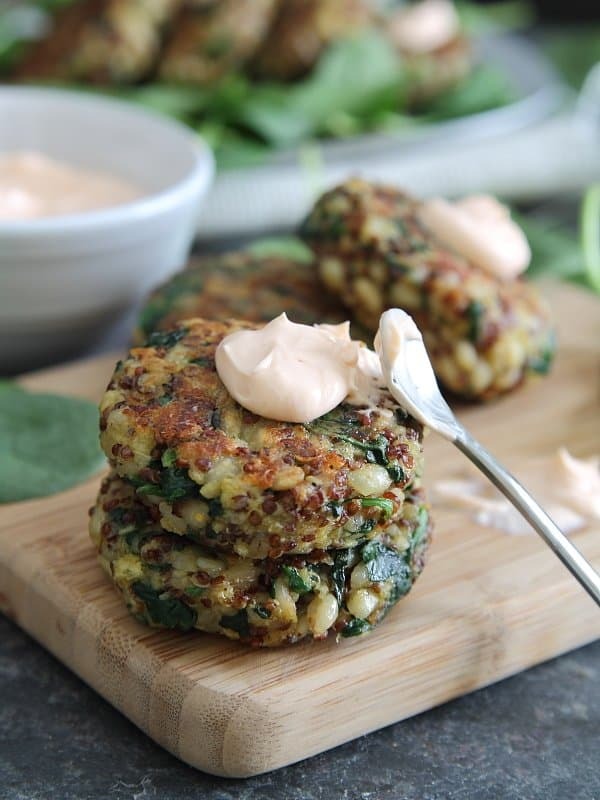 These spinach and cheddar quinoa cakes with creamy buffalo dip are packed full of healthy quinoa, barley and spinach. Dipped in a cream cheese buffalo sauce, they’re an addictive appetizer or side! Last week, after 3 years without cable and thinking I got absolutely no channels on my tv, I found out that basic channels (2-13 and a bunch of Spanish channels) actually come through. I won’t get into how dumb I felt for not knowing that or how many nights I wished for a simple episode of Jeopardy to turn on in the background while making dinner so I could scream at the tv when I actually knew an answer (or more correctly, a question). So obviously, I watched hours and hours of news, bad daytime tv and most importantly, the new episode of Scandal last week to make up for the 3 year hiatus. Also, I got to watch the Oscars last night. Normally, I avoid these celebrity gaga fests like the plague. If there’s anything more obnoxious to me than a bunch of celebs strolling down a red carpet while annoying announcers tell them how great they look and gossip over which designer (who 99.9% the population watching will never be able to afford to wear) did their dress, suit or borrowed jewelery, I honestly can’t think of it. But, 3 years without tv will make you do crazy things and subject yourself to that exact kind of torture. When did getting pregnant before getting married in celebrity world become like the “thing” to do? Seriously, there are way more than just the handful of “exceptions” these days. And yes, I realize how old this makes me sound but it’s not that I disapprove or anything (I really couldn’t care less about the reproductive habits of famous people) I just don’t get it. It’s like, “oh, I can totally make my mind up that I want a kid, but marriage? Ehh, I don’t know…” Um, newsflash people, marriage is reversible, kids aren’t. How is the kid decision an easier one to make than the marriage one?? It takes way less commitment to get married than to have a kid. 18 years from now, your marriage could just be a distant memory and an alimony check but that kid will be making a mess of your house and asking for a quarter million bucks to go to college. But I’ll stop bitching about pregnant celebrities and talk about these quinoa cakes. No tough decisions to make with these, they’re packed with quinoa, barley, spinach and cheddar, insanely good, only get better with a creamy buffalo dip and way less of a commitment than kids. These spinach and cheddar quinoa cakes with creamy buffalo dip are packed full of quinoa, barley and spinach and served with a cream cheese buffalo dip. Add the shallots, cook 1 minute then add the garlic, cook for about 30 seconds until fragrant. Add the spinach and cook for about 1-2 minutes until wilted. Add the mixture to the large bowl with the quinoa and barley. Beat the eggs and milk together in a small bowl then add to the large bowl. Add the breadcrumbs, cheddar and salt and pepper to taste. Using the same skillet, add about 1 tablespoon of cooking oil of choice and heat over medium-high. Shape the mixture into patties and cook for about 3 minutes on each side until golden brown. Transfer to a paper towel lined rack to drain. Add oil to the pan as necessary while cooking the patties. Combine the cream cheese and yogurt in a small bowl and stir until mixed together and smooth. Add the buffalo sauce and stir until incorporated. I definitely won’t be hopping on the “preggo bandwagon” anytime soon. Definitely not ready for that. I also don’t watch the oscars for the same reason. However, I can DEFINITELY get into these. Cheddar and buffalo? Everyday. All day. Pinned! All over these… they look so delicious! These are GORGEOUS! And I love the contrast of flavors with the buffalo dip. Such a fantastic recipe! 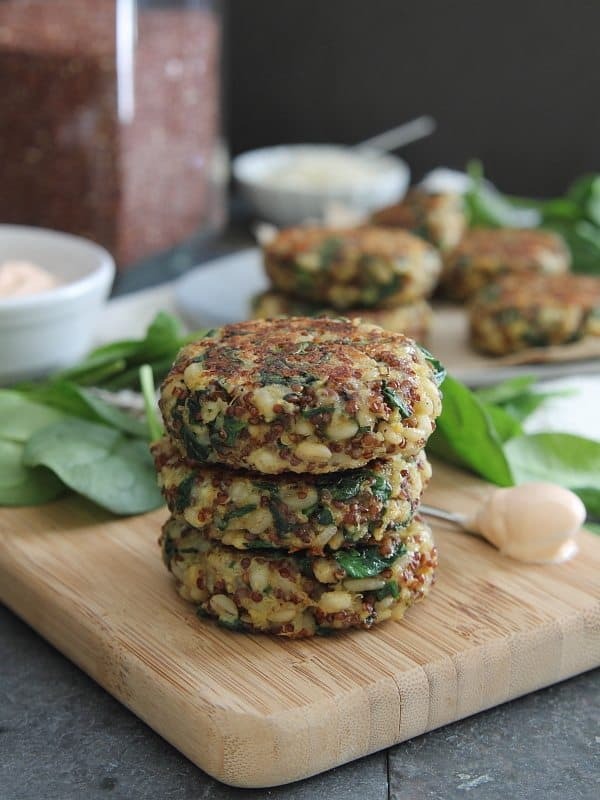 Love the addition of barley in the quinoa cakes! Gorgeous pictures too. WOW! 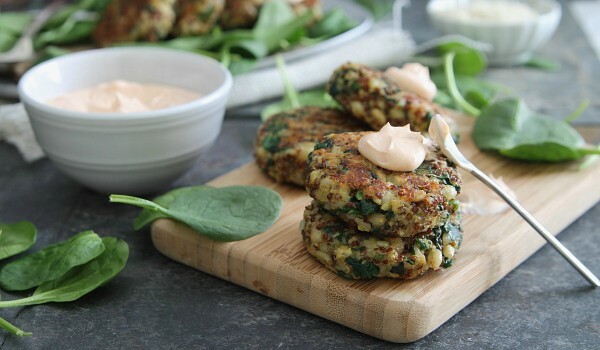 These look fantastic :D I need to make these ASAP – I LOVE all the baby spinach packed into them!! Wow – these look so great. Thinking of other possibilities for the creamy buffalo dip – mmmmm! As a mom — who struggles OFTEN — to feel “mom like” in that special, caring, patient way… I couldn’t agree more. Marriage is reversible. Kids are not. And they are way, way more of a life commitment than you can really ever realize before you have them. Thinking kids is an easy decision but marriage isn’t, doesn’t compute. Yum! These were awesome! I love the buffalo dip too! Mine didn’t hold together as nicely as yours, but at least looks don’t run the taste! I made these last night and they are awesome!!! Just finished them for lunch – I had it with a really thin bun with hummus and greens. So tasty. And they held together great (I wasn’t sure when I mixed it up, but they did). These are so good! We love them! We even love without the sauce -! Thanks! Just wondering if you happen to know around how much calories per cake. Im just watching my intake and calories. Just put these on the menu for next week – can’t wait to try them! I adore the idea of light and creamy buffalo sauce on top! And from someone who is dealing with infertility, the confusion about the whole celebrity baby-is-my-accessory thing is more enraging than anything else. I couldn’t agree with you more. Wow…these look amazing! Any suggestions for a gluten free option? I know I can find GF breadcrumbs…but what about for the barley??? Just made these – absolutely delicious! I didn’t have quinoa, instead I used bulgar which worked great. I also ended up using about 4 cups spinach and 1/2 bread crumbs. So GOOD. Thanks so much for the recipe! I’ve made this a couple of times now. I’m so glad I’ve found a vegetarian dish my husband and toddler will both eat (happily). I love the buffalo dip. I will add that last night when I made it, I used frozen chopped spinach successfully, though the first batch was a bit wet and stuck a little to the pan. I think I should’ve squeezed out more water. It did save me a little time since the spinach was pre-chopped. I also used sweet onion because I had it on hand. Thanks for a great recipe. It’s in our regular rotation. I pinned these awhile ago, but I’m going to make these tonight for dinner. I’m getting hungry just thinking about them! sub barley for Bulgar like Marley did. used frozen spinach but defrosted and squeezed out as much water as I could. It was delicious! I ended up using a 1/4 c. to portion them out and froze them for the nights I get too busy to cook from scratch. Used all barley. No quinoa in the house. Frozen spinach instead of fresh.